Chris Wingert became the second Long Island native to win a major sports championship this year. The Babylon son and St. John the Baptist High School graduate won a Major League Soccer title with Real Salt Lake two weeks ago, joining Rob Scuderi, who won a Stanley Cup with Pittsburgh and hails from Syosset. Wingert, who graduated from St. John’s University and won the Hermann Trophy in 2003, college soccer’s equivalent of the Heisman, is a defender and has jumped around a bit in the MLS since his rookie season in 2004. He was selected by Columbus 12th overall in the 2004 MLS draft, then acquired by Colorado in 2006 in exchange for a draft pick, before finally ending up in Salt Lake in 2007. 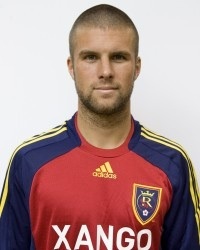 Wingert, 26, has risen as one of the top and most reliable defenders in the league.